Despite Alcamo being one of the richest cities in the Trapani area, it coexists with paradoxical situations of social degradation. Unemployment and marginalization are among the most serious problems families must face, especially those with mentally disabled members. In light of the twenty years’ experience of the Non-Profit Organization Associazione Servizio e Promozione Umana (Human Promotion and Service Association) in supporting these realities, the Cooperativa Sociale RossaSera was born. A facility created for rehabilitation purposes to promote autonomy of assisted persons, aimed at job placement and recognizing a specific therapeutic relevance in agricultural activity. 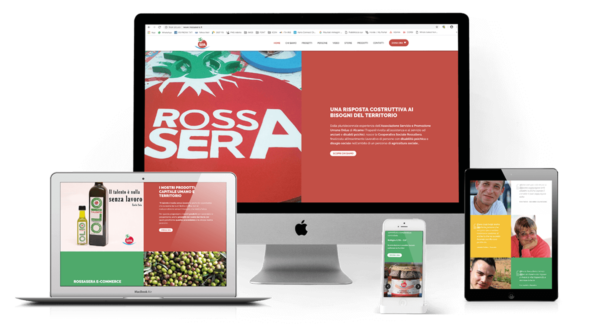 We have chosen to support this project pro bono by creating the new rossasera.it website and providing continuous technical assistance for its use. A website created with the design responsive technique – so it is captivating and easy to use regardless of the device used for the connection – that offers the opportunity to contribute to the social project by making donations or buying products of the Cooperative, including the delicious Olio Talento, an extra virgin oil made with Cerasuola quality olives.